health outcomes, including psychological distress (Dambrun, e.
well-being of female refugee torture survivors. poses of punishment, intimidation, and coercion (Pope, 2001). mental health effects on clients (Kira, 2001; Kira et al., 2008). various forms of trauma based on their severity and complexity. trauma that is discontinued (e.g., sexual or physical abuse). women (Watts & Zimmerman, 2002; Zimmerman et al., 2003). power and control over women (Heise, 1998). ternalizing/externalizing outcomes are taken into consideration. namics (Pittaway, 1999; Pittaway & Bartolomei, 2001). 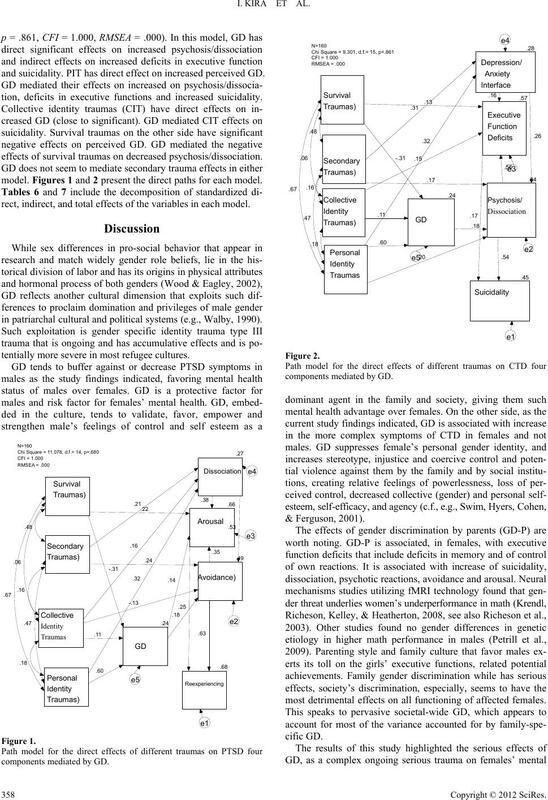 work conflict (Foley et al., 2005; Gutek, Cohen, & Tsui, 1996). explaining between 5% and 15% of the observed variance. 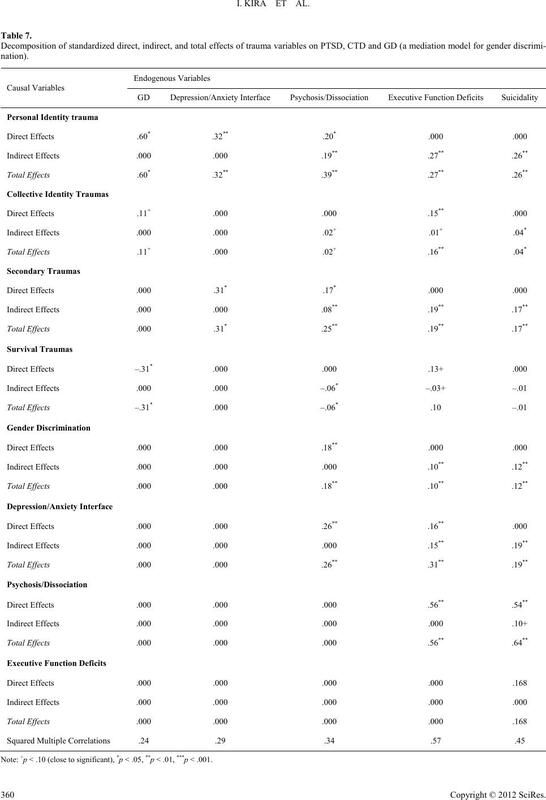 accounting for 20% of the variance in PTSD scores. females that lead to increased symptoms for them. traumas) on CTD and PTSD. vors and 143 secondary torture survivors (family members). Female = 21, Male = 10), and others (Female = 21, Male = 38). discriminant validity (Weathers, Keane, & Davidson, 2001). between .67 (communality of the item) and .72 (factor loading). rence including gender discrimination by parents and society. authorities as a torture victims. equation model SEM (AMOS 7 software), (Arbuckle, 2006). of the direct and indirect effects of each variable in the model. Bootstrapping is a computer-intensive re-sampling technique. scales, and CTD and its four sub-scales in females sub-sample. scales. 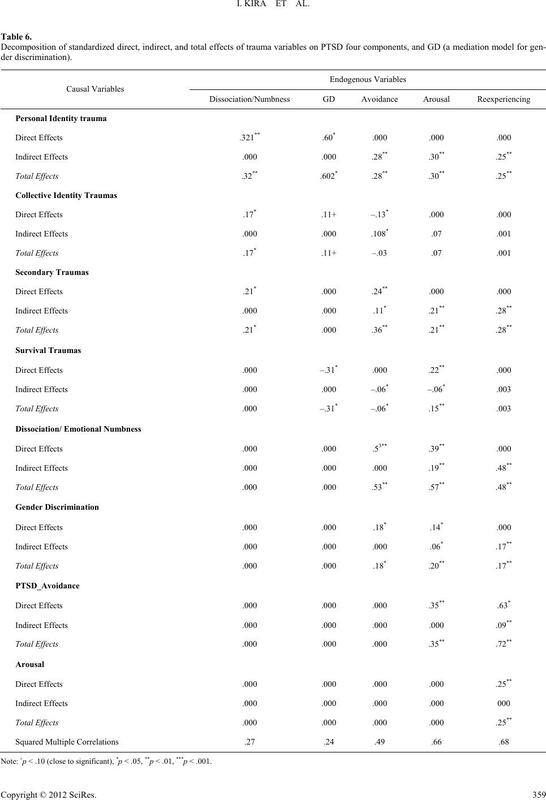 Table 1 presents these results. significant at the 0.05 level (2-tailed). 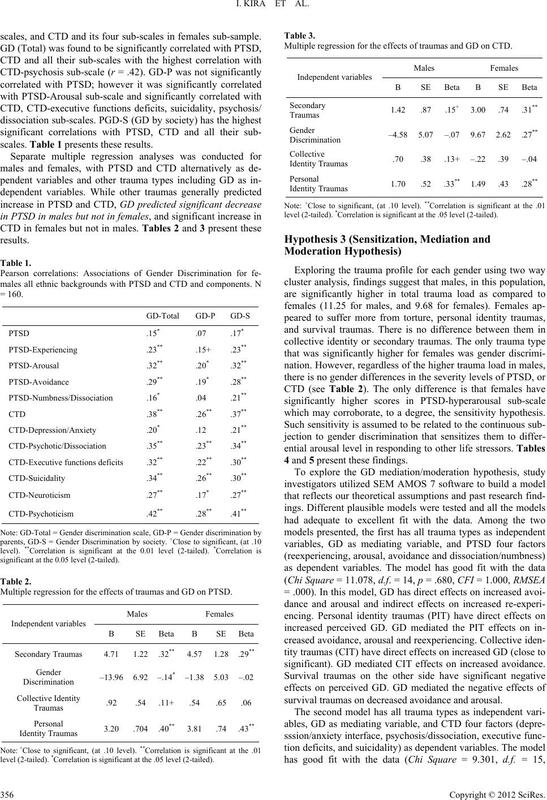 Multiple regression for the effects of traumas and GD on PTSD. level (2-tailed). *Correlation is significant at the .05 level (2-tailed). 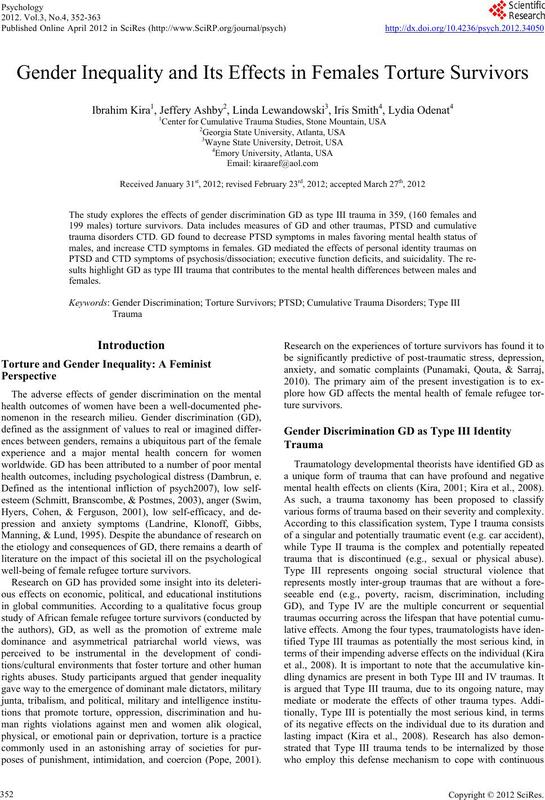 Multiple regression for the effects of traumas and GD on CTD. which may corroborate, to a degree, the sensitivity hypothesis. 4 and 5 present these findings. significant). GD mediated CIT effects on increased avoidance. survival traumas on decreased avoidance and arousal. 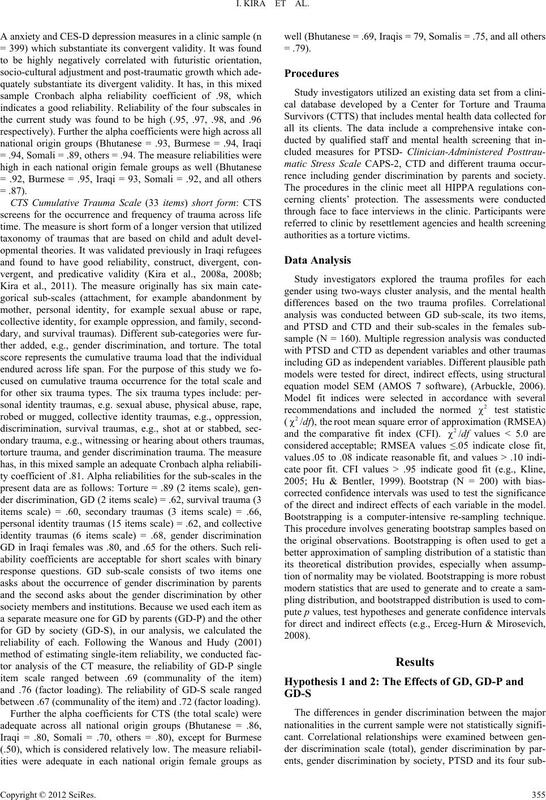 Centroids that depict the trauma profiles for those that suffered perceived gender discrimination and those that do not in the sample N = 359. 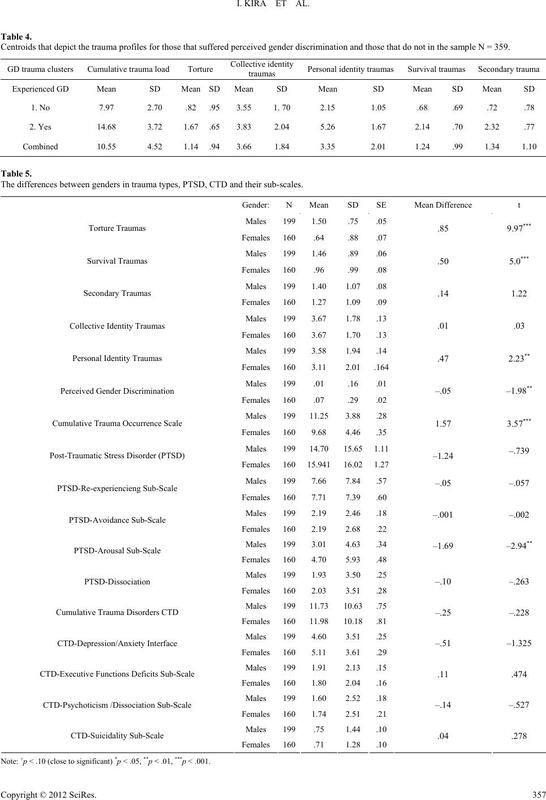 The differences between genders in trauma types, PTSD, CTD and their sub-scales. ote: +p < .10 (close to significant) *p < .05, **p < .01, ***p < .001.
and suicidality. PIT has direct effect on increased perceived GD. tion, deficits in executive functions and increased suicidality. effects of survival traumas on decreased psychosis/dissociation. model. Figures 1 and 2 present the direct paths for each model. rect, indirect, and total effects of the variables in each model. in patriarchal cultural and political systems (e.g., Walby, 1990). tentially more severe in most refugee cultures. most detrimental effects on all functioning of affected females. Note: +p < .10 (close to significant), *p < .05, **p < .01, ***p < .001.
ote: +p < .10 (close to significant), *p < .05, **p < .01, ***p < .001.
chosis/dissociation; executive function deficits, and suicidality. traumas on PTSD or CTD symptoms. pants; however, they also reported higher PTSD symptoms. explanation of the differences between genders in mental health. against further shorter term adversities. of discrimination to be equal to other crimes of discrimination. reduction in torture incidents and in extreme conflicts. erment of women are vital goal. der competent counseling for girls and women. other traumas is important when working with female clients. Development Studies. URL (last checked 27 August 2009). Astbury, J. (1999). 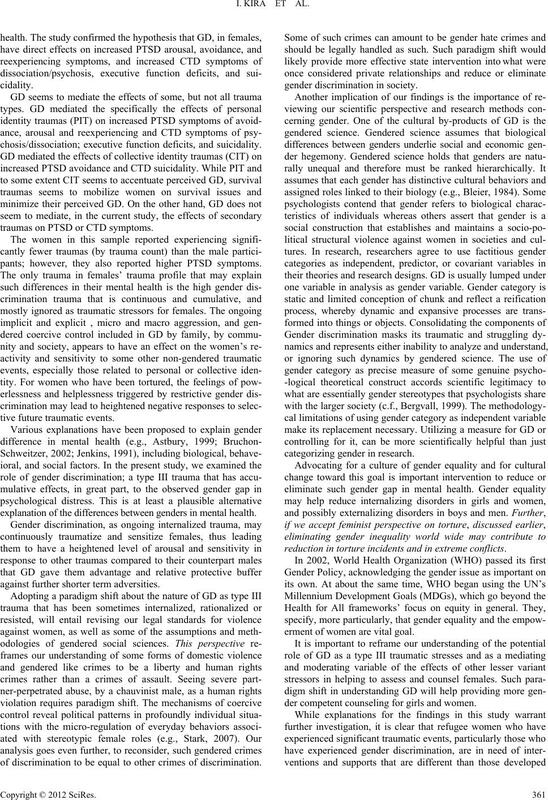 Gender and mental health. Working Paper Series No. gender. Language in so ci et y, 28, 273-293.
scale for assessing current and lifetime PTSD: The CAPS-1. theories on women. Oxford: Pergamon. third world. Social Sc i e n c e M e di c i n e , 3 9 , 1237-1247. Applied Social Psychology, 37, 1118-1129.
research. 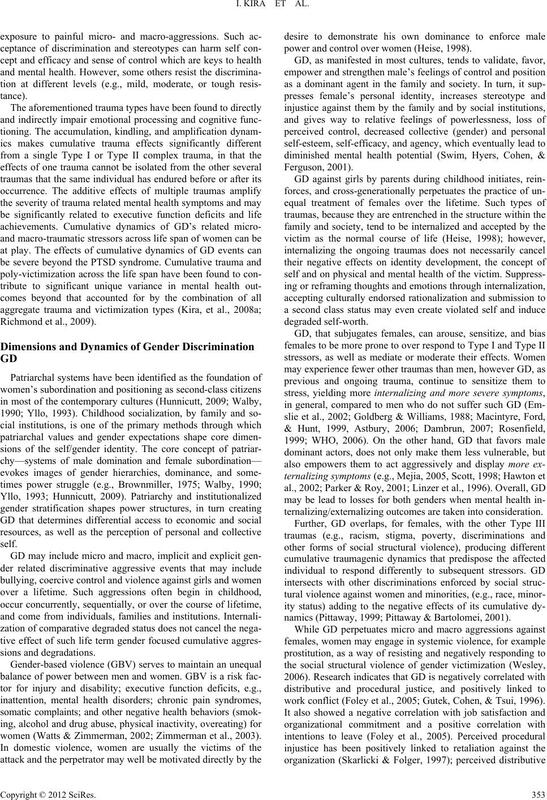 American P sy ch ol og is t, 63, 591-601.
crimination and justice: Are there Gender Differences in Outcomes? Group Organization Management, 30, 421-450.
and Social Psychology, 70, 491-512.
tomorrow. Journal of Man agement, 16, 399-432.
discrimination. Human Relations, 49, 791-813. England. British Medical Journal, 23, 1207-1211.
framework. Violence Against Women, 4, 262-290. The hidden health burden. Washington DC: World Bank. havior in children and adolescents. New York: Guilford. covariance structure analysis: Conventional versus new alternatives. Structural Equation Modeling, 6, 1-55. Jenkins, R. (1991). Demographic aspects of stress. In C. L. Cooper, & S.
(Vol. 14, pp. 107-132). Chichester: John Wiley & Sons. Counseling and Clinical Ps ycho logy , 66, 19-36.
approach. Traumatology: An International Journal, 8, 23-51.
matology: An International Journal, 2, 1-14.
tertiary appraisal of traumatic events across cultures: Two studies. Psychiatric Nurses As sociation, 16, 299-306. Traumatology: An International Journal, 14, 62-87. Convention, Boston: APA PsycExtra Data base. Iraqi refugees and their etiology. Ethnicity & Disease, 17, 79-82.
modeling (2nd ed.). New York: The Guilford Press. chiatric symptoms. Psychology of Women Quarterly, 2 4 , 93-99. Krendl, A., Richeson, J. A., Kelley, W., & Heatherton, T. F. (2008). neural mechanisms underlying women’s underperformance in math. Psychological Science, 1 9 , 186-175. Landrine, H., Klonoff, E. A., Gibbs, J., Manning, V., & Lund, M.
MD 1000 study. Amer ica n J our nal o f Medicine, 1, 526-533. 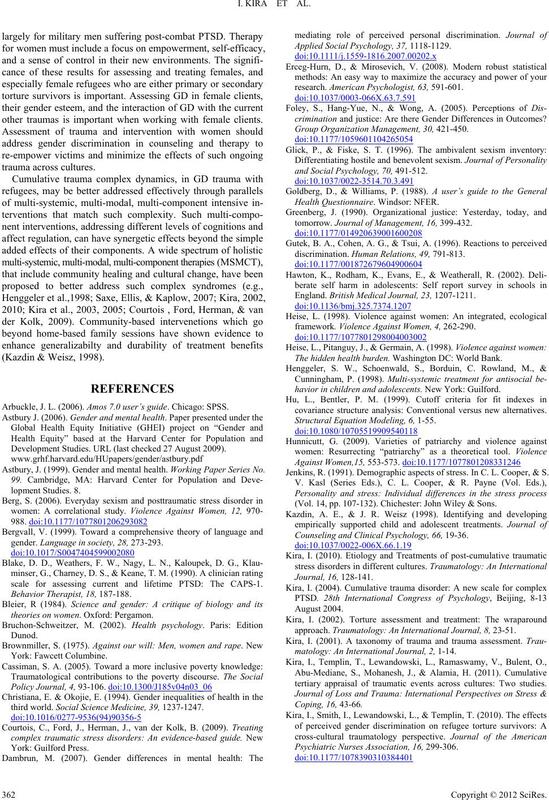 Parker G, & Roy K. (2001) Adolescent depression: A review. Australian and New Zealand Journal of Psychiatry, 35, 572-580. 10-years old twins. Behavior Genetics, 39, 371-379. Pittaway, E. (1999). Refugee women—The unsung heroes. In B.
Periodical on Refugees, 19, 21-32. Richmond, J., Elliot, A., Pierce, T., Aspelmeier, J., & Alexander, A.
logical distress in college women. Child Malt reatment, 14, 127.
psychopathology, men more, or both the same (and why). In A.
Horwitz, & T. Scheid (Eds. ), Handbook for study of mental health. approach. New York: Guilford Press. life. New York: Oxford University Press. Swim, J. K., Hyers, L. L., Cohen, L. L., & Ferguson, M. J. (2001). Walby, S. (1990). Theorizing patriarchy. Cambridge: Basil Blackwell. and extension. Organizational Research Methods, 4, 361-375.
scope and magnitude. 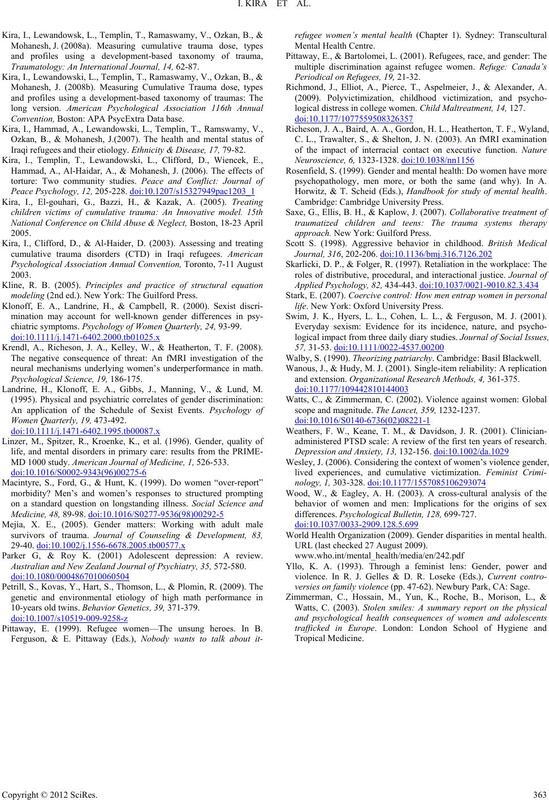 The Lanc et , 359, 1232-1237.
administered PTSD scale: A review of the first ten years of research. differences. Psychological Bulleti n, 128, 699-727. World Health Organization (2009). 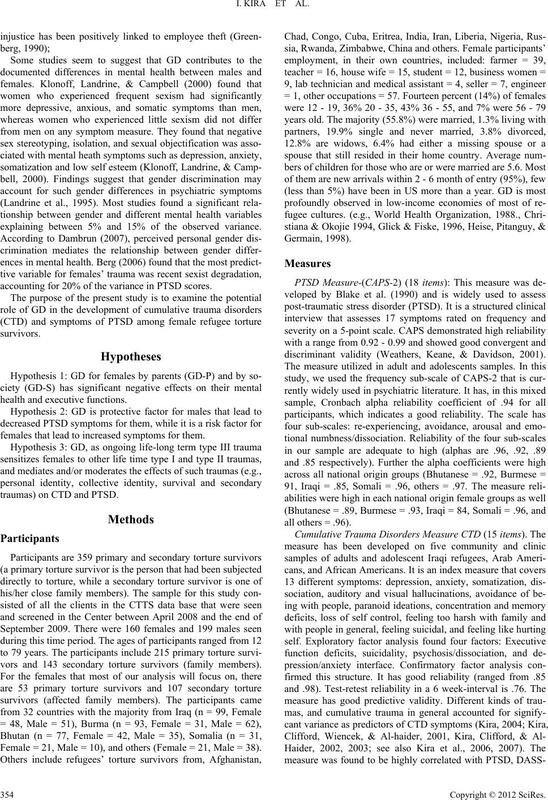 Gender disparities in mental health. URL (last checked 27 August 2009). versies on family violence (pp. 47-62). Newbury Park, CA: Sage.